Connections is the companion volume to the BBC television series “Connections” produced in the Autumn of 1979. I originaly read connections after watching the BBC series on my local PBS station. Connections explores an “Alternative View of Change” (the subtitle of the BBC series). Burke thesis us that technology advancement is the result of a web of connections between separate events. Each event is the result of one person or group acting as the result of separate motivations. Each chapter begins with a particular event or innovation from Ancient or Medieval times and traces a path through a series of seemingly unrelated connections to a essential aspect of the modern world. For example, the chapter “The Long Chain” traces the invention of plastics from the development of a type of 16th century Dutch cargo ship. 1. History is driven by individuals acting only on what they know, with no concept as to where their actions will eventually lead. Therefore, we will be surprised to what the innovations of today eventually will lead. 2. History progresses because of the synergistic interaction of past innovations. 3. As history progress, the number of innovations increases and the number of innovations accelerate. Burke concludes by asking what happens when this rate of change becomes too much for the average person to handle? What will this mean to our freedoms? 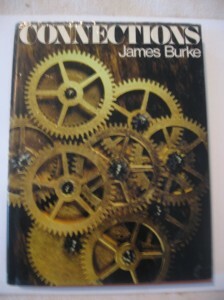 Overall it is entertaining to see by the connections Burke is able to weave among past events to today’s advancements.